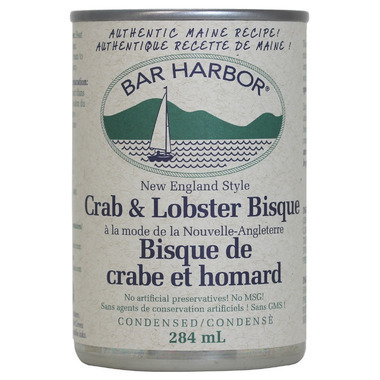 At Bar Harbor, their authentic, all-natural bisques are made with real milk and cream, and are pureed with fresh lobster and crab. Their delicious bisques are guaranteed to delight your palette and keep you feeling good – whatever the weather! Ingredients: Milk, Finely Ground Crab, Minced Lobster, Cold-Pressed Canola Oil, Enriched Wheat Flour, Tapioca Starch, Sea Salt, Sherry, Evap. Cane Juice, Salt, Pepper Spices. Good soup for those times when you don't want to cook. Tasty! Okay taste, but on the thin side. Very good,but just a touch spicy. Would buy again.